Looking for a new mattress but not really interested in paying any money for it? Well you’re in luck because today I’m kicking off a giveaway of a brand new bed from Ecosa! The Ecosa is an adjustable mattress, so you can change the layers around to find the right firmness for you. This mattress is water proof, which is great for protecting against spills in bed. I think its a great choice for kids and guest rooms! Don’t miss out on your chance at winning a brand new Ecosa mattress! I think the Nectar would be my favorite! These are great reviews and all seem very comfortable. We love being able to give away a good nights sleep! I like the purple mattress and this ecosa mattress because either one would suite our needs. Aireloom is my favorite latex mattress – they look so plush & comfortable! Purple because I can’t stand to be hot at night and it sleeps cool. Also I don’t like really firm mattresses. I hate being hot when I sleep too. Good choice! We love the Purple options too! I would love to win! Getting off the couch for an actual bed would be amazing. Good luck! We hope you get off the couch soon. We are so sorry to hear that Amber. Good luck to you and the pooches! I love the NECTAR mattress the best. I think the purple sounds like a wonderful mattress. Zenhaven is great! Good pick! This sounds like an amazing mattress from what I’ve read. I have seen so many reviews for so many different mattresses – it’s hard to keep them all straight. But I seem to recall being particularly impressed with the Zenhaven mattress! Lots of choices out there for sure. I liked theTempurpedic Cloud Supreme review. I love Purple the best! Purple is a great choice! I love the versatility of this mattress! This seems to be a very popular pick! This looks fabulous. I really would love to have one. Looks great! Love that it’s adjustable. I think this mattress would do nicely! Good luck to you Jim! Ecosa and purple seem like a good choice for me. I am a side sleeper so not too firm or arms fall asleep. Not good. Nothing is fun about waking up with tingly arms. Nectar is probably my favorite followed by the Purple mattress. Thank you for your Fantastic social outreach. You guys are great. I’m ready for a new mattress. The Zenhaven Mattress sounds dreamy since my husband and I are both side sleepers. We read through a lot of reviews and ended up getting a Tuft and Needle mattress for our son that needed a new mattress, based on your reviews, were very helpful. I am so glad we were able to help you pick out a new mattress for your son. That is awesome! I’m looking forward to a good night’s sleep! My favorite latex mattress is Zenhaven Mattress! The Zenhaven is a great choice! I like the Idle Sleep hybrid. Don’t mind a soft top layer, but like to feel support underneath. Sounds like it would be a great choice for you. It is hard to choose I know! We are so glad you like it Amanda! We bought a purple mattress and my daughter loves it. Now we need a new mattress. We are so glad she likes it! I’m a side sleeper and I like the way the mattress can be adjusted. I desperately need this. My bed got way too soft way too soon and I can’t afford to replace it. That is so true Carol! At this point I would love to try any of these mattresses. All of them sound pretty great. Lanie says one of each please! Looks amazing for sure. It’s hard to find a good comfy mattress. It’s hard to choose but I like how this one has adjustable layers. Adjustable layers are pretty awesome! Would love this due to Health issues! Would love to have this for my daughter. She needs a new mattress. This is a great give away for someone needing a good mattress for good restful sleep. The comparisons are helpful to see the difference in competitors mattresses compared to Ecosa, which is superior. I wish everyone the best of luck! Thanks Roberto! We are glad we are able to provide some help with our reviews. I love how not only is this bed waterproof but it’s also adjustable. It does have some great features! I don’t know how you make such comfort happen, but it sounds like an ideal way to getting a good night’s SLEEP! so many great reviews! Purple, nectar- this one! Looking for something not too firm! oh wow id love to win this bed!! Either the Nectar or Casper – tough to choose. The Ecosa mattress is now my favorite because the layers are adjustable. I have chronic pain and this would be great to be able to choose what firmness is right for my body at different times. Best of luck to you Alicia! This bed would work great for me! I would just keep it as it comes in the medium firmness level. I’ve been looking for a “great” mattress. Nothing wrong with that. We all need “great” sleep! I love mattresses that you can adjust for firmness, but I’m not picky. I would really love to win any decent mattress. Good luck to you Kalla! Gotta say, my favorite is still the Zenhaven, but this Ecosa mattress sounds/ looks really comfy too. The Plushbed would be another choice for us! I think I need to go back and review the reviews again LOL!!! I know the Zenhaven is great for side-sleepers. Although we both fall asleep on our backs, we are primarily side-sleepers. I think I’m thinking right!!! Honestly though, anything would be better than this thing I have now… I hate sleeping! I wake up in pain every day! It’s destroying my hips & back. Noone should hate sleeping Laurie. We wish you the best of luck! This sounds like a nice mattress! I love the fact that this mattress is so adjustable! Thanks again for another wonderful review! Good luck to you Sandy! I don’t really know the qualities I need in a mattress but I think the fact that it’s adjustable sounds promising. I couldn’t care less that it’s waterproof but I wonder if it’s lightweight- as it looks pretty small. At any rate, I’d love to win a good mattress. Best of luck to you Savannah! I could use a mattress! Wishing you the best of luck Marilyn! The Ecosa, I love that it’s waterproof. It’s is perfect for the guestroom. It would be a great guest room choice. I like the Spindle, it sleeps cool & I need that. Sleeping cool is a good feature to have. They all sound wonderful since my mattress is hand me down twice! I think the Ecosa would be just what I need. Truthfully they all sound dreamy! Good luck to you Paula! I need a new mattress badly! Best of luck to you Andrea! Ive wanted one of these for a little while now! Drewm come true to finally get some real sleep and comfort. 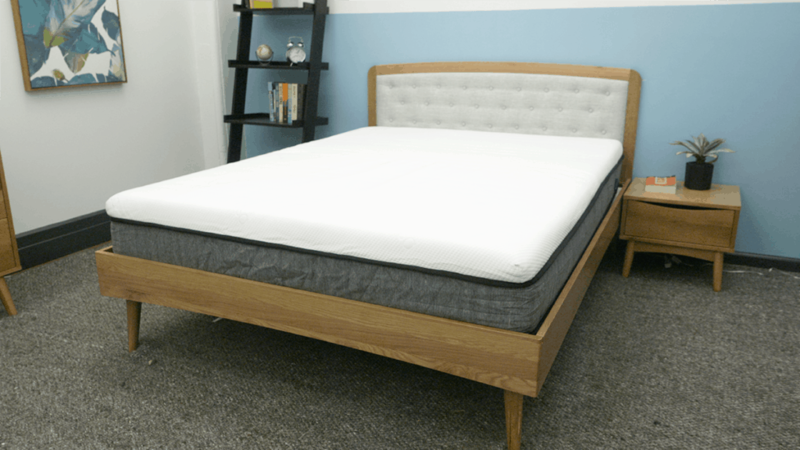 I love the Loom & Leaf mattress review the best! My favorite latex mattress is the Avocado Green mattress. It’s definitely a comfy one. Good luck Jason! It can be hard to choose. We understand! I really like the Ghost Bed reviews! I need a new mattress so badly but have not pulled the trigger on one! These look fantastic! Sounds like it might be time to pull that trigger! So excited about this giveaway I cant wait to see who wins. Hope my girls nicol Young, trish Murphy and Jessica Stewart get their entries in. Looks like it would be a fabulous mattress and the price point is excellent. It is affordable and a great mattress. Love that you can adjust it around you. Adjustable is such an awesome feature. This mattress is amazing and I am definitely going to ty it for my nest mattress purchase. We are excited to hear that! I think I loved the Purple mattress review the best!! I think the Ghostbed would be a good choice for me. My favorite is the Idle Sleep Latex Mattress. My fingers are crossed for this Ecosa mattress! It is hard for me to chose just one of the mattresses. I like many things about each! Also love the fact of being waterproof. Because of health I spend aot of time in bed. We think that is a great feature too! Best of luck to you Linda! Sounds like a really nice mattress! Thanks for the opportunity! It looks so comfy! I need a mattress so badly. Good luck to you Susan! Looks like a sweet mattress! My question is, will the winner have to pay taxes and shipping charges on this free bed?? I won a sofa from a different company, after taxes and shipping it was going to cost me just over a grand for a FREE sofa. Just curious, how free this will be? I REALLY NEED A NEW BED!!!!! Looking forward to winning this excellent new mattress! The fact that I can adjust it to my own body is a BIG plus! We love that feature too! I would like to win a brand new mattress from Allswell Home! This would be amazing. Thanks for the chance. Currently have TheGhost Mattress and not too happy with it. Would love to try this mattress. Sorry to hear you are not happy with the mattress. Best of luck to you! Would love to try out a mattress. New mattress time is always a good time! Looks like a decent choice. I need a new Qeen size bed ! Best of luck to you Ben! I’m in desperate need of a new mattress. Thanks for the winning opportunity! We love to give away mattresses! This mattress sounds great! :) I love that you can adjust the firmness and that it’s waterproof! We love that part too! THIS IS A GREAT IDEA TO CHANGE THE LAYERS IN THE MATTRESS TO GET THE RIGHT FIRMNESS. THIS WOULD GIVE ME A GREAT NIGHTS SLEEP. I love that you all give mattresses away. That is very sweet. I just hope it is all going to people who need them and not just people who are popular sweepers. We love to give them away and we definitely choose based completely on random luck. Keep entering! fI like the Ecosa mattress because is adjustable, waterproof and will be great for my guest room. Zenhaven for this side sleeper! this mattress ,ight just be what I’m looking for! I believe the Ecosa mattress would be a answer to my prayers. I have many health problems and hurt alot of the time. I believe your mattress could really help me. Best of luck to you Melanie and keep entering. We have lots of contests. It can be a big and tough decision. Best of luck to you! im sleeping on a couch bed. Oh no! Definitely time for a new mattress then. I really like the GhostBed. I need a new mattress so bad! My Serta failed after 1 year, and they won’t honor the 10 year warranty because I bought it at Big Lots. Keep entering! We love to give away mattresses. Good luck to you Tina! Casper is my favorite review. Honestly I don’t know you have reviewed so many!!! I just want one new one! It is a big decision. We hope our reviews can help. I watched the review on this mattress and I love how it has 3 different layers so you can actually set it up based on how you sleep. I am mostly a back sleeper but I do sleep on my side at times. Thanks for the review!!! The layers are pretty awesome. LOOKS like an inviting night of rest. I think I like the Zenhaven Latex mattress the best. The review indicated it is good for side sleepers. I think Idle Sleep is the best. This mattress sounds amazing and I would love to have it in my home. Thank you for having this giveaway. You are welcome Joyce. We will do more! Thanks so much Valerie. We have lots of contests to keep entering! Looks like a very comfy bed. I really like the adjustability of the layers. Not sure I’ve seen that before. The layers are such a great feature. I still like the Layla. Yes please! Would LOVE to win this new mattress! Mine is OVER 30 years old…uuugghhh!!!! 30 years is a long time. Definitely time for a new one! Good luck! I like the Purple Mattress because I am a side sleeper. The ZenHaven sounds the best! Purple is a solid choice and we know there are lots of options. I like the Casper . Keep entering. We give them away a lot! Would really love to have the opportunity to win! The Purple is still my favorite. Good luck Logan! Boy I really need a new mattress and would love to win, thanks! Keep entering. We love to give them away! I could really use a new bed! I could quit sleeping on the couch! We need a new mattress so bad I’d love this to surprise my Wife with! Best of luck and keep entering! We will have more contests soon. I need to win because I need a new mattress. The Ecosa mattress sounds great to me, just what I need! Would love to win this super comfy mattress!! I am most interested in the Zenhaven and Spindle mattresses, thanks to you. I used to like the Layla but after reading this ecosa review I like this also. Sounds great! I love how this one is adjustable. But for my fav in the latex mattress I think the Hybrid one sounds the best for what I would need. Moving into a new home, and this would be perfect for us or our guest bedroom! I need a new one like now ! Thanks for having these giveaways . I really really want to win this. Best of luck to you Jamie! Awesome mattress. Thanks for the chance. What a great mattress to win! I like the sound of the Ghost Bed the most..